Restaurant Adara brings modernist cuisine to the city of Montclair, NJ, just 20 minutes outside New York City. Customers rate Adara very high on service and are delighted by the artful presentation and combination of flavors of Chef Ghoshal’s dishes. Chef Tre Ghoshal shared the recipes of some of his signature dishes with us. After a rough start less than a year ago with mixed reviews, Adara seems to have worked out the kinks and its customers are now giving the romantic neighborhood restaurant very positive reviews. “Our server was excellent, very knowledgeable and professional.”, “Chef Tre Ghoshal's restaurant is upscale, without being pretentious, and his food is clever, without being gimmicky.”, “Despite its high caliber, Adara's prices are reasonable, and you always leave satisfied. GM Phil & team deliver impeccable service and offer endless knowledge.”. 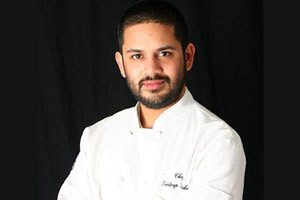 Chef Ghoshal has had experience in kitchens on both the east and west coasts. A graduate of the Art Institute of New York City and Humboldt State University, Arcata, CA, he began his career in 1994 working under highly acclaimed chef Joe Bastianich of FOX television's MasterChef. 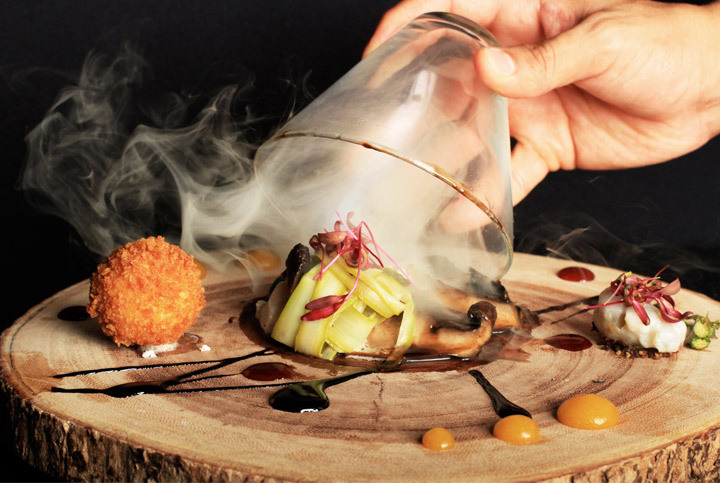 After years of study, research and working alongside several notables in the industry, he decided to open a venue that would serve as a catalyst to present a fascinating dining experience. He previously served as the executive chef at The Rotunda, at Neiman Marcus in Paramus, NJ, The Savoy Grille in Newark, NJ, Nouveau Sushi in Montclair, NJ and as chef de cuisine at The Eureka Inn, Eureka, CA. He draws inspiration from such masters of culinary innovation including Wylie Dufresne, Grant Achatz and Ferran Adrià. Chef Ghoshal and GM Philip Dowling shared with us a few of their dishes and detailed recipes. A robust, aerated chowder broth over sautéed little neck clams with celery, carrots and onions, as well as pancetta suspended in maple syrup. On the spoon over the bowl, a cold presentation of: raw little neck clam on the shell, pan fried quail egg sunny side up, masago caviar, oyster cracker, chive oil, micro greens, and deep sea wind (shellfish foam). 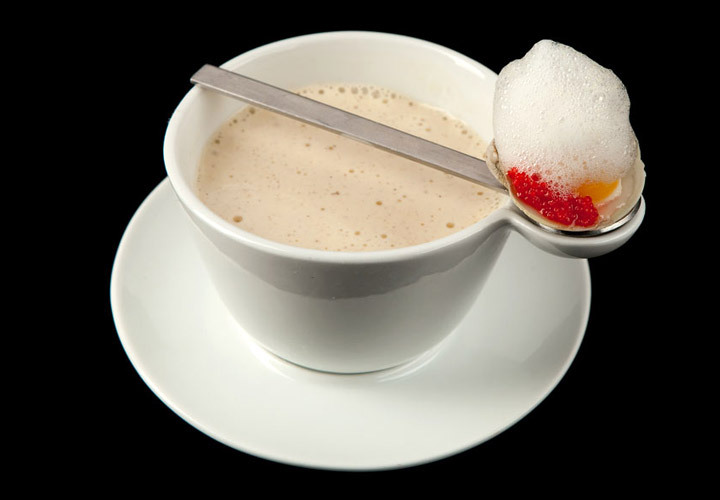 Techniques: aeration of broth through ISI Whip w/ NO2, emulsification of shellfish foam with soy lecithin, suspension of pancetta in maple syrup w/ Kappa. Get this modernist cuisine recipe here. The filet is sous vide for 45 minutes at 125 degrees and then grilled. Served over 2 Peruvian chili pepper sauces- aji amarillo(with yuzu) and red panca. We top the filet with asian bbq flank steak jerky, crispy shallots and chives. 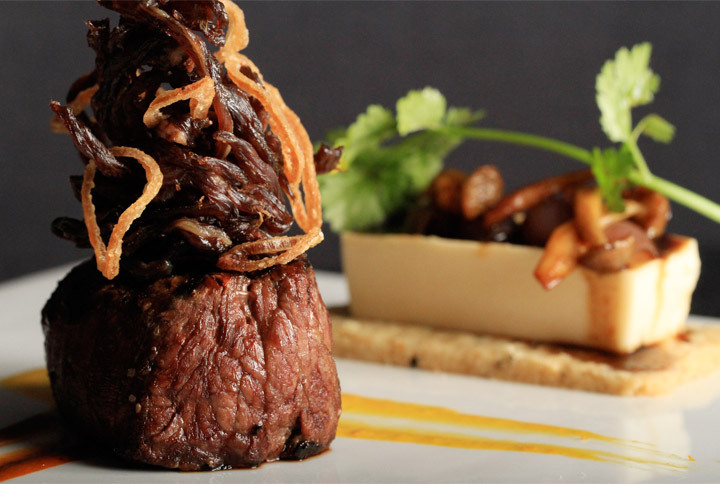 We pair the filet with a smoked gouda custard served over an onion shortbread cracker. Atop the custard, tea smoked beech mushrooms, glazed onions, porcini mushroom demi-glace, and vidalia onion gel. Techniques: gelification of gouda custard with iota and kappa carageenan, sous vide filet, dehydration of bbq beef jerky, gelification- vidalia onion gel, smoking with tea. Get this modernist cuisine recipe here. Marinated roasted portabello mushroom topped with asparagus ribbons, truffle balsamic, and hazelnut powder. Arugula sphere, roasted garlic and herb gnocchi, fried Humboldt fog goat cheese fritter, apricot gel, pinot noir gel, porcini soil. Smoke trapped over center piece released at table. Dish served on acacia wood plate. Techniques: smoking gun, gelification of apricot and pinot noir gels, spherification of arugula, dehydration of porcini soil, transformation of hazelnut oil to powder with tapioca maltodextrin. Get this modernist cuisine recipe here. Foie gras orb (made using hemispherical molds) dipped in a sour cherry gellan, served semi-frozen over pistachio crumbs. 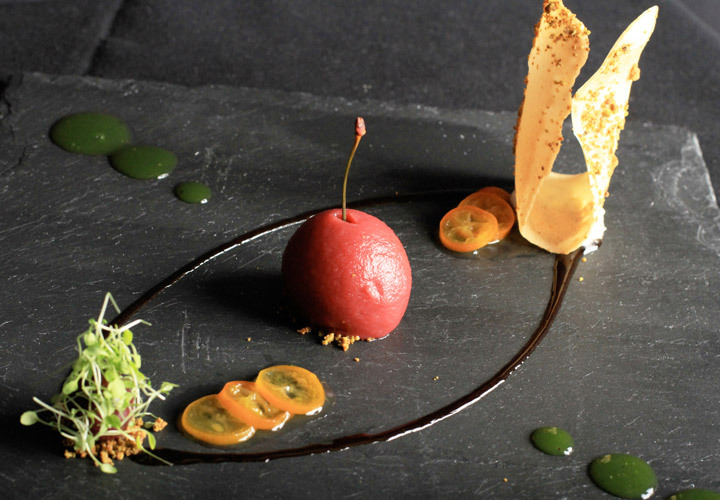 Cherry molasses, apple mint oil, kumquat confit, sour cherry jam, pistachio tuile cookie, white truffle oil mousse. Techniques: sour cherry dip made with gellan gum, sour cherry jam- sous vide with pectin, white truffle oil mousse- emulsified white truffle oil using glycerin flakes, put through ISI Whip w/ NO2 to achieve the foamy mousse. Recipe coming soon! 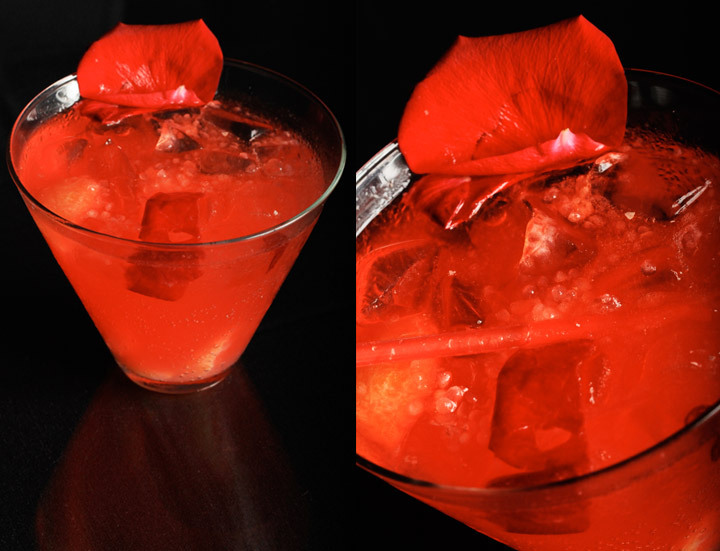 Meyer lemon/rose lemonade, rose syrup, rose caviar, rose petals, clementine compote, club soda. Our version of a caprese. 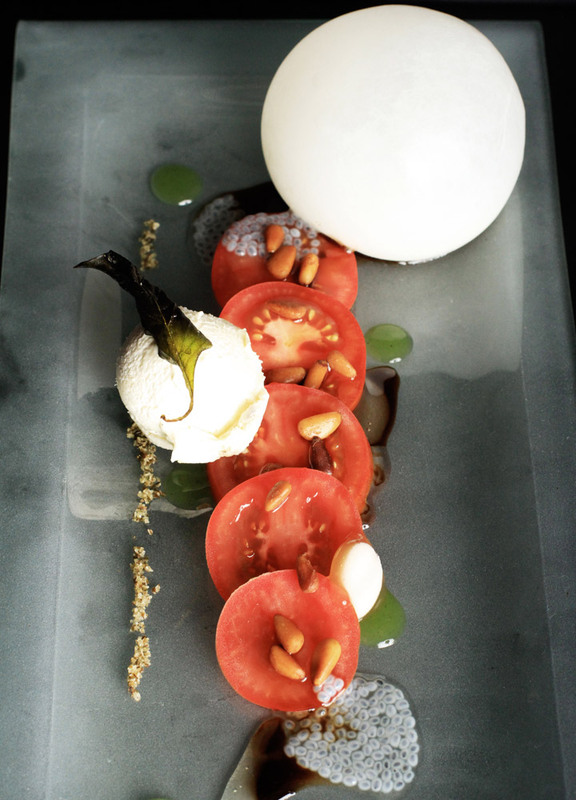 Campari tomatoes(currently using colorful varieties), fig balsamic glaze, toasted pine nuts, fried basil leaves, basil gel, basil seeds(soaked in water), basil salt, white balsamic peach candy disc, extra virgin olive oil gelato (evoo), mozzarella balloon. Techniques: mozzarella balloon blown up with NO2 or CO2, evoo gelato made using liquid nitrogen, white balsamic peach candy disc jellified and frozen on anti griddle, basil gel using ultratex tapioca starch.